Scary magic. Bad Fairies. Wolf people. DEAD BABIES. I want to preface this by stating that I reallly wanted to love this book — I used to work at the cafe where Janni wrote I’m sure a large portion of this very book. I served her coffee at least once a week for probably four years. I didn’t realize she was an author, however, until after I had already left that job. I also sat in on a panel she gave at the Tucson Festival of Books last weekend before I’d had a chance to read this (actually, I started and finished it that afternoon). She is a very interesting speaker, and was very nice to me when I got her to sign my book (not sure if she actually remembered me, but I did tell her I used to serve her coffee. She probably didn’t recognize me without my black t-shirt and grimace of customer-service-related anxiety). 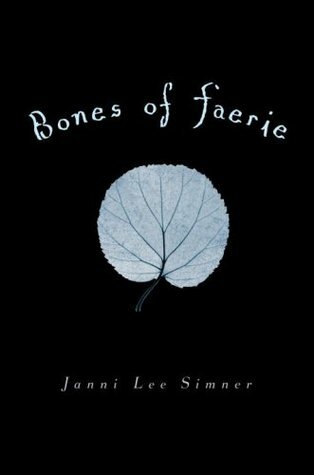 Sadly, I didn’t quite like Bones of Faerie as much as I wanted to, but I DID like it quite a bit. Bones of Faerie is set in a post-contemporary world just a couple of decades past a war with Faerie that devastated both sides. This setting and the way that Janni has the war affecting our world was one of the best parts of the novel. After the war, our world changed irrevocably. The plants and animals become magical and dangerous, trees and vines and bushes, if not kept at bay, will strangle or attempt to take root in human bodies. Farming is now a dangerous way to cultivate food. Animals are larger and more fierce. Insects burn with fire. It’s not safe to walk alone at night because you never know what’s going to come out of the darkness to try and end you. And children are sometimes born with magic in their blood, a magic that could kill everyone around them. Our heroine is Liza, and our introduction to her sets the tone for the entire novel. She tells us immediately that she used to have a baby sister, but when that sister was born touched by magic (evident by her white hair and brilliant eyes), her father took the baby out into the woods for the fairies to reclaim, if they wanted her, essentially leaving her for dead. Instead, Liza (having run out of the house later that night) watches as her infant sister is eaten by wild animals, bones breaking, and blood spattering. And that is literally the first two pages of the novel. Welcome to Bones of Faerie! Soon after witnessing this, Liza realizes she has also been touched by magic and flees her town, knowing it’s either that or have her throat slit by her own father, who is abusive and absolutely maniacal about eradicating magic. I loved the brutal but honest way this book engages these characters and this world. It gives it a realistic (and terrifying) flavor that is missing from a lot of YA. This is another reason I was surprised by my general reaction to the book. As much as I liked the themes and the setting and the general arc of the plot, it read like it was being geared towards the younger portion of the YA audience. Maybe that’s just because of the length. At 247 pages, the book is too short (the font is big and the pages small). For me, there wasn’t enough time. Not enough time passing between events of the plot, which happen at lightning speed, and not enough time for me spent with these characters getting to know them. This is one of the reasons I say it’s young-skewing, because younger readers don’t necessarily need the length to connect, but as I get older, zip-zooming through plot just isn’t satisfying anymore. I like conversation and introspection. I like thought. Anyway, once Liza flees (followed by her friend Matthew, who turns out to be a wolf-shifter), she soon realizes other places in the world don’t treat the magically gifted with fear and violence as her town does. This leads her to exploring her world in a way she never has before, ultimately coming to terms with the death of her baby sister and her abandonment by her mother soon after. One of the coolest (and saddest and creepiest) bits in the book (highlight for spoilers: featured Liza, whose magic can summon or send away, having accidentally summoned the departed soul of her baby sister Rebecca, and that shadow following her around lost for the bulk of the novel, until Liza realizes who she is and puts her to rest). This book was very well written, and a really fast read, I just couldn’t connect with it in the way I wanted to. I am going to finish out the series, because I feel like I will automatically enjoy future books more, because it means delving deeper into the world. And they’re quick reads anyway. But if you like YA and fairy stories, this is definitely something you should check out. The honesty and brutality of Janni’s story isn’t something I’ve seen before in this genre. Share the post "Scary magic. Bad Fairies. Wolf people. DEAD BABIES." It sounds interesting, but 247 pages is awful short… I’ve seen longer pamphlets. Plus I’m always a bit iffy with YA books. Not to disparage an entire genre (more or less), but it seems like the young-woman-perseveres-in-dystopia concept has been done to death. How many more books are there in the series? Hmmm, judging from your taste in books (that I’ve seen), I’m not sure this would be your cup of tea. Oh, and two more in series. Which I will review shortly.